>Winter has well and truly arrived here in Manchester. Initially, it came in fits and starts, drunkenly staggering frostily here and there, but now it’s running its icy fingers up and down all our spines, and my extremities are in a constant state of chilly anxiety. Manchester is renowned for its dreadful weather. Pewter-grey skies are the norm, usually accompanied by a constant fine drizzle which, helpfully, saps one’s will to live within days. Look at this webcam, and I’m willing to gamble the image you’ll see will be 50% fuzzy grey. Living in Manchester is like living inside Tupperware. It’s no wonder Mancunian bands like The Smiths, Joy Division and The Fall are so relentlessly downbeat. Today’s New Band, Yes Please! hail from the outrageously named places of Espoo, Olari, Uusimaa in Finland. If that isn’t making you splutter into your mug of coffee, then you, sir/madam, are not human. At ANBAD, we have a soft spot for bands from the north of Europe, due to their almost unwavering lust for jangly pop songs. Yes Please! proudly exhibit this love too. Imaginary Success is about as growlingly hostile as Finnish guitar pop gets, a big heaving song that runs and runs and runs and then collapses. Enjoy and Laugh also flits between their twin ideals of brassy pop and earnestness. Yes Please! was the name of the Happy Monday’s last, dreadful album. They were from Manchester too, but their music was stupendously, well, happy – though this may have had something to do with the industrial quantities of drugs they consumed. Yes Please! the band are nothing like the Happy Mondays, but their music is just as joyfully enthusiastic. Listen here! Posted on November 11, 2008 by Joe Sparrow. 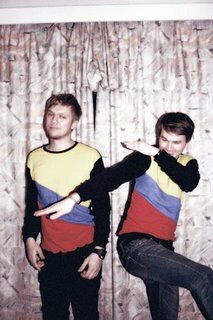 This entry was posted in Today's New Band and tagged Finland, jangle, Manchester. Bookmark the permalink. MIDWEEK MIXTAPE // 27th July 2010 | A New Band A Day!